OMP's Tecnica Lucida suit utilizes a outer layer of ultra-light Novata Nomex wadding, and an inner layer of DuPont's trademarked "Delta C" Nomex material. Delta C is interwoven with carbon fiber and Kevlar threads. 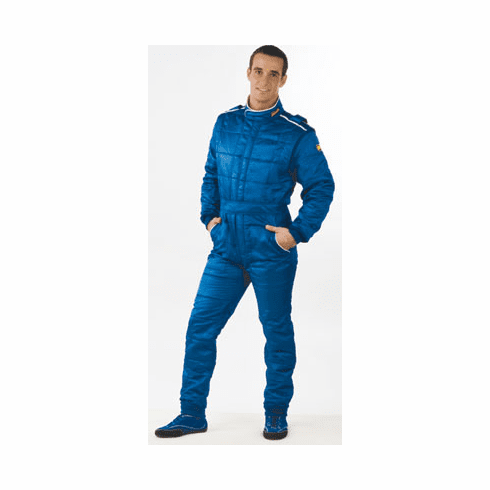 It is lighter, cooler, softer, and transpires better than regular Nomex III. These materials enable OMP to make three layer suits that are lighter than two layer SFI-5 suits, while still providing the same protection. The Tecnica Lucida suit also incorporates knit panels under the arms and around the shoulders for added cooling and flexibility. These new bellows are made from elastic fabrics and allow for greater comfort and ease of wear. Box quilting and double-stitched seams. 9 Sizes: from 46 to 62.